Energy use data are usually disaggregated by major end-use sector: residential, commercial, industrial, transportation. Generally speak-ing, data are weakest for the commercial sector, perhaps because this sector is often defined as a residual (i.e., that portion of the economy not included in the other sectors). However, energy use in commercial buildings accounts for about 15 percent of total U.S. energy use and is grow-ing more rapidly than energy use in other sectors. For example, commercial energy use amounted to almost 10 QBtu (10 EJ) in 1979; the average growth rate in commercial sector energy use was 1 percent per year between 1973 and 1979, compared with a growth rate of 0.3 percent per year for total U.S. energy use [1; 8]. 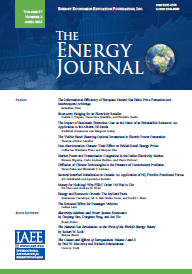 Published in Volume 3, Number 1 of The Quarterly Journal of the IAEE's Energy Economics Education Foundation.